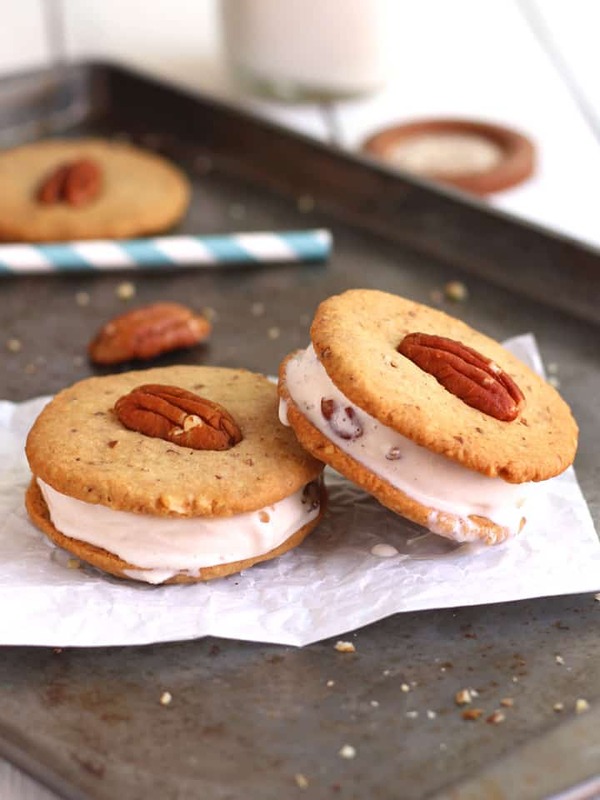 Mini Maple Pecan Ice Cream Cookie Sandwiches! A small batch dessert recipe for 3 perfectly portioned cookie + ice cream treats that are under 300 calories per serving! This is a dessert, a full-fledged no nutritionally redeeming value just tastes delicious treat! Most days that treat is a regular ole cookie but occasionally it’s a creamy crunchy Mini Maple Pecan Ice Cream Cookie Sandwich. A good ice cream cookie sandwich starts with the right cookie. We’ve got over 14 different toaster oven cookie recipes that would love to hug a scoop of ice cream, especially these soft Double Chocolate Cookies, giant Chewy Molasses Spice Cookies for Two or these vegan-friendly Whole Grain Soft Oatmeal Raisin Cookies for Two that you can make in your mini-chopper! But as much as I love a soft and chewy cookie they offer no contrast to smooth creamy ice cream. 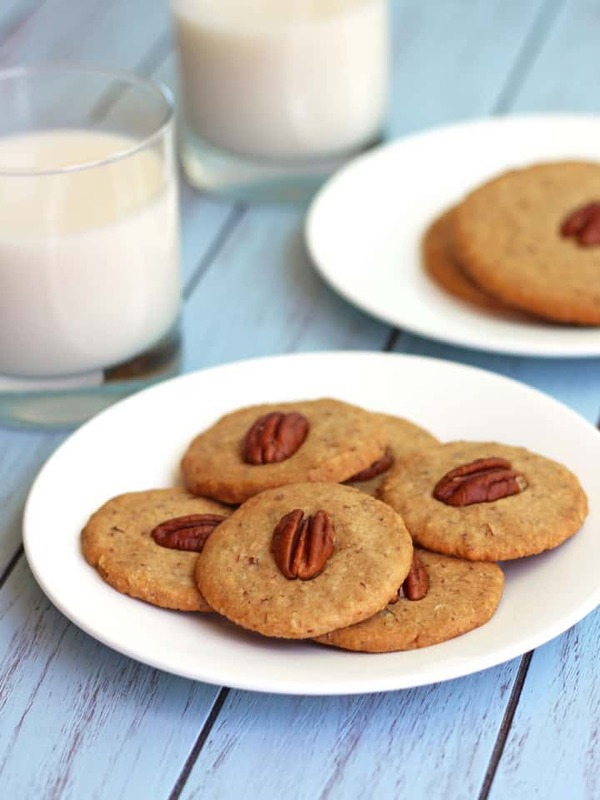 That’s why these maple pecan cookies are perfect for making ice cream cookie sandwiches with! They have a delightfully crispy shortbread texture that softens just slightly as the sandwiches setup in the freezer. This way you still get a little crumbly cookie crunch in every cooling bite. The first time I made them I decorated all of the cookies with whole pecan pieces. While they looked pretty, having a whole pecan at the base of your cookie sandwich is not a great idea. So let’s all learn from my crushed cookie whoopsie and only decorate the tops. I hope you enjoy every bite of these perfectly portioned summertime treats. 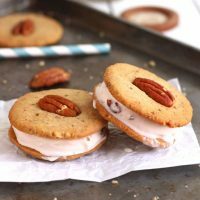 Even with rich butter, sweet maple syrup and crunchy pecans these Mini Maple Pecan Ice Cream Cookie Sandwiches still come in just under 300 calories per serving! 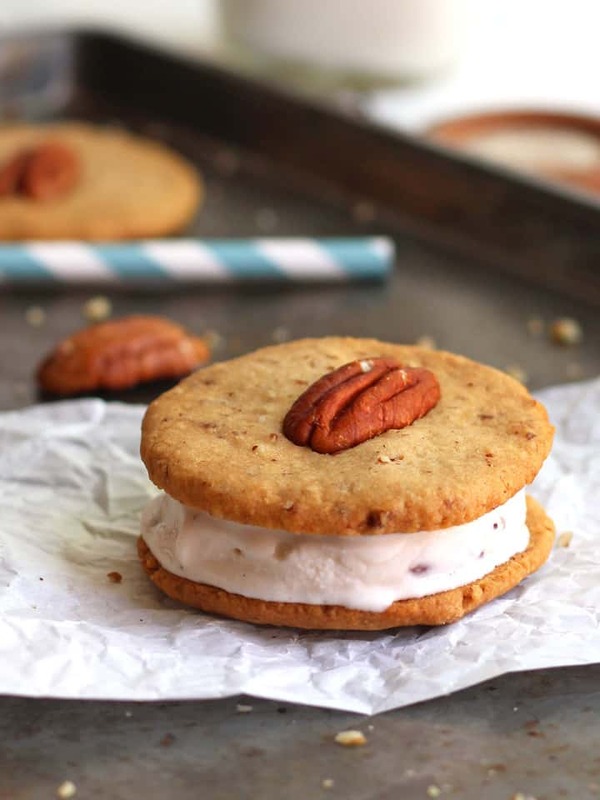 Pair these mini maple pecan cookies with your favorite ice cream for 3 perfectly portioned summertime treats! In a small bowl use a wooden spoon to cream butter with maple syrup and vanilla until smooth and light, about 2 minutes. 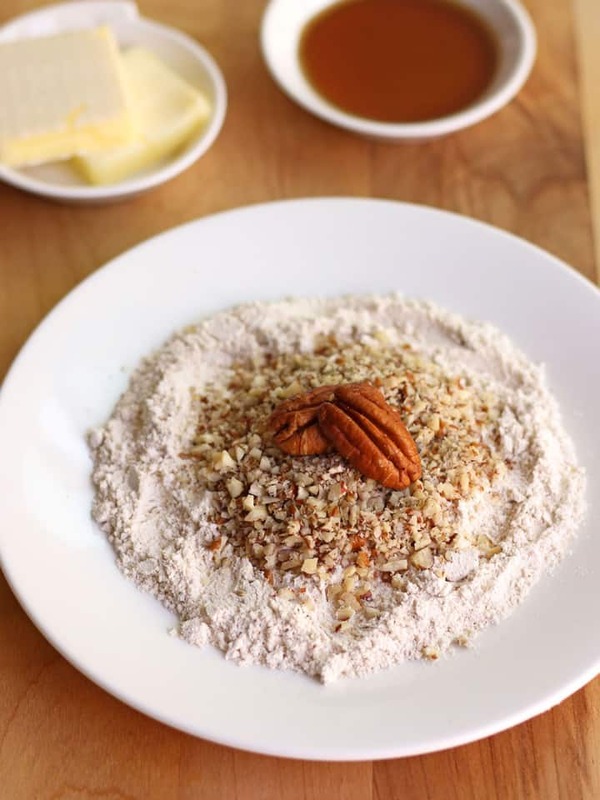 Mix in pecans, flour and salt until combined. Dough will be very soft. Refrigerate dough at least 15 minutes. Once dough has chilled preheat toaster oven to 350 F and lightly oil your cookie sheet or line it with a toaster oven baking mat. Divide dough into six equal pieces and roll into balls. Place balls at least 2 inches apart on cookie sheet. Using your fingers or the bottom of a floured glass gently press dough into circles 2.5 to 3 inches wide and 1/8 inch thick. Press a whole pecan into the center of 3 cookies. Bake cookies for 13 to 15 minutes until the edges are golden brown. 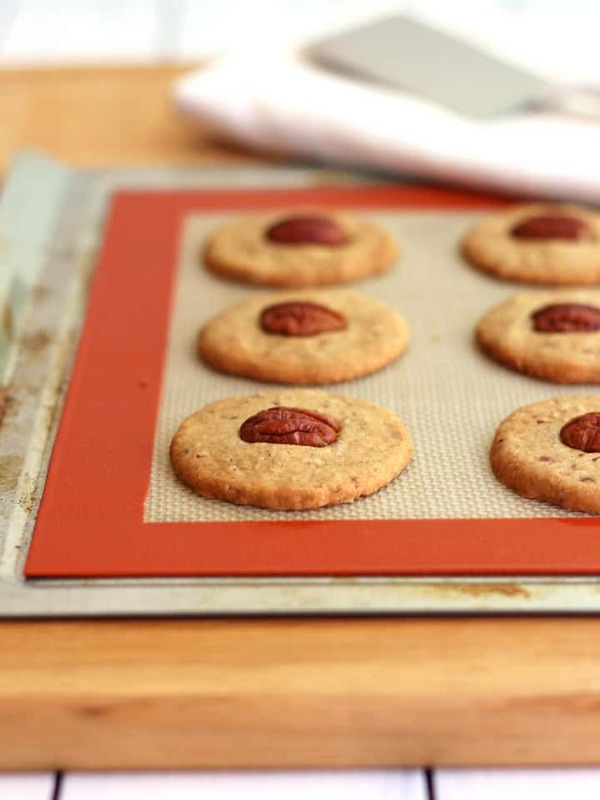 Allow cookies to cool completely on cookie sheet. (The cookies may seem soft out of the oven but they will crisp up as they cool). Place a scoop of the softened ice cream on the flat side of a cookie then top with another cookie. Press gently to spread the ice cream evenly, if you press too firmly you will break the cookies. Wrap cookie sandwiches individually in plastic wrap and return to the freezer for a few hours until the ice cream has firmed up completely or just go for it and dive in. Nutritional Information is an estimate for 1 Ice Cream Cookie Sandwich made with one scoop of full-fat Southern Butter Pecan Ice Cream. You can greatly reduce the calories and fat by substituting a lighter ice cream. Prep time includes 15 minutes dough refrigeration but does not include additional freezer time as that is optional. Cookies can be baked ahead of time and stored in a sealed container for up to 3 days (they may stay good longer but we’ve never had a batch make it past three days without being eaten up).